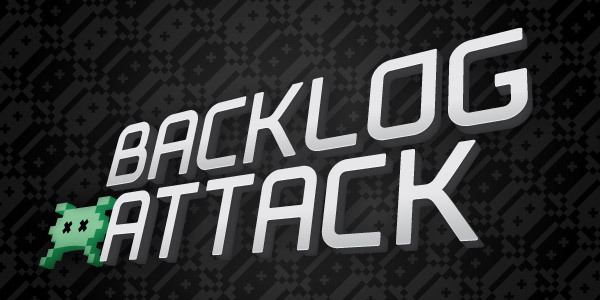 UPDATE: The Backlog Attack will end at midnight on August 29! (That’s late Sunday/early Monday morning.) Make sure you comment with your final progress before then so we can select a backlog champion! It’s been a long summer but we’re finally into the last month of 2016’s Backlog Attack. This month, we’re going retro by finally playing some of the oldest games we have sitting around, and that’s the key to becoming the backlog champion for August: Dust off those neglected retro titles, and be rewarded! Of course, “retro” can mean different things depending on who you ask, so we’re keeping our definition a little flexible. (For instance, on this week’s show we decided to play some Sega 3D Classics, a SNES game, and… Final Fantasy X-2?? Sure!) Just make sure you post the games you’ll be playing in the comments below so we can follow along as usual! As a reminder, in September we’ll pick a backlog winner from June, July and August to receive prizes, plus one overall backlog champion, who will win the new Fall release of their choice! Even if you haven’t thrown your hat into the ring until now, it’s not too late! You can get the full contest details in June’s post, but basically: make as much progress completing your retro backlog this month, and at the end of the summer you might be lucky enough to hear those fateful words: A WINNER IS YOU! Remember to follow us on Twitter for more Backlog Attack updates, and listen to the show in case we announce a special backlog challenge. I’m still playing FF5! It’s great. It’s probably (definitely) going to go into September, which I expected since it’s pretty long, but it’s my main portable game right now and I don’t see myself stopping. I’ve been getting through 1-2 dungeons per day, with some occasional job point grinding. Well I guess I lose the backlog attack this month. Killzone – I’ve completed a play through with Templar. I am now playing on hard with Luger. After that, 2 more play throughs to get the platinum trophy! I’ve gotten the platinum trophy in Killzone, and I went back to Minecraft: Story Mode to get that platinum. I’m now playing God of War. Finished God of War. I just have the 5 hour speed run remaining to get the platinum. I played Braid, and I solved the first 5 puzzles. I am stuck on the final level. 2) Sly 2: Band of Thieves. As of today, I finished the story of Sly 1 in about 8 hours of gaming, so I’m starting Sly 2 now. Sly 1 and Sly 2. Didn’t get to game much this month, but it was nice playing those on the vita. They had their frustrating parts, since the game play segments are pretty diverse, but overall, I enjoy the characters and the format.